Habiba Ismail Khan can't forget the day her eldest son ventured out to get food and water. Their Mumbai slum had been overcome by communal rioting, sparked by the destruction of the Babri Mosque by Hindu hardliners in faraway Ayodhya. This week marks the 20th anniversary of that event, one of the biggest tests since independence of India's secular ideals. After days trapped inside, the sounds and smells of killing around them, he made a dash for supplies. "He was 18, the only earner," says Habiba. "My heart cries for him every day." Caught by a Hindu mob he never had a chance. He was one of nearly 600 Muslims killed in the Mumbai riots, the bulk of the victims. At least 275 Hindus died too. But far from being spontaneous, a government commission later concluded much of the violence was an organised pogrom by Hindu extremists. Two decades later, Muslims remain a marginalised minority - although minority seems the wrong word for a group that numbers nearly 180 million, making India the third largest Muslim nation in the world after Indonesia and next-door Pakistan. Yet while its neighbour is in constant turmoil because of Islamic extremism, it's striking how little it has emerged in India. "Fundamentalism has not taken root here," says Vikram Sood, the former head of India's foreign intelligence service. While there have been bombings claimed by indigenous groups such as the Indian Mujahideen, they have been few and far between and there is no sign it has significant support. 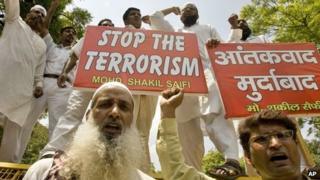 The biggest attacks in India involving Muslims have had clear evidence of Pakistani involvement. Despite having 10% of the world's Muslims to recruit from, al-Qaeda has made no headway here. And no Indian Muslim has gone to fight in Afghanistan with the Taliban. "Or even Kashmir," adds Sood. Yet the provocations have continued - with hundreds more Muslims dying in the 2002 Gujarat riots, when there was again clear evidence of Hindu extremists orchestrating the killing. After the death last month of Bal Thackeray, the leader of a right-wing Hindu party accused of a central role in the 1992 Mumbai riots, Habiba was bracing herself for a repeat. "Things can go wrong any time. We are just counting the days." One thing has changed though in Jogeshwari - a sprawling slum area with lanes so narrow residents often have to walk single file. Mixed areas have largely disappeared and there is now a clear division between Muslim and Hindu neighbourhoods. A road marks the "border" between what Hindus call "Little Pakistan'"and their side, Hindustan, or India. People in the Muslim part of Jogeshwari see little hope of their lives improving. "Only Hindus get good jobs, in banks or government," complains Habiba's neighbour Marzina, who moved into a cramped two-room house with her family after the riots for safety. The figures back her up - showing Muslims bumping along the bottom with Hindu untouchable castes and tribal groups in income, employment, literacy and access to education. While they make up 14-15% of the population, they hold barely 4% of government jobs and they are far more likely than other groups to be in informal employment, running street stalls or the like. Some Muslims are doing well: Indian movie stars like Shah Rukh Khan, Salman Khan and Aamir Khan. But they don't emphasise their heritage. Another big industry name with Muslim origins, film-maker Mahesh Bhatt, believes it helped him that his mother covered them up. She was Muslim but says she gave him a Hindu name to prevent his identity from becoming "an albatross". He now uses his movie fame as a platform to speak out for Muslim causes. India pretends to be more secular and inclusive than it is, he maintains. "Why does India celebrate a black man in the White House?" he demands when we meet at his Mumbai office. "I'll celebrate only when we have a Muslim in the prime minister's chair in India." To critics, Bhatt is a habitual controversialist with a gift for a headline. But he is unusual in speaking up at all for India's Muslims. Unlike Hindus, they have no national political party representing them. There is a stronger tendency to keep quiet and work with the system. "We can't go and live in another world," says Dr Mohammed Khatkhatay who runs a charity providing education and training in Mumbai's slums, mostly to Muslims. In some ways, this is just common sense. However many there are, Muslims are still a minority. "If I pierce someone's eye," says Dr Khatkhatay, "the result will be the whole of our community goes blind." It's much harder for any cohesive Islamic identity - let alone militant ideology - to gain ground in India's huge and diverse society - where Muslims share little except their faith. So a Muslim from Kerala in the south who may be descended from seafarers has more in common with Hindus or Christians in the state than he does with Muslims from Uttar Pradesh in the north. The widespread adherence to more moderate, inclusive Sufi Islamic teachings have also helped stall the emergence of militancy. The government also has a tighter hold on madrassas or religious schools, which in Pakistan have become a bedrock of recruits for the Taliban and others. Looking across their borders to its majority-Muslim neighbours, Indian Muslims have concluded they are better off here, argues Najeeb Jung, Vice Chancellor of Delhi's Jamia Millia University. "The big watershed was 1971," he says, when Bangladesh broke away from Pakistan. "If ever there was a romance with Pakistan, it was over then." Dr Jung is less gloomy about Muslims here, believing "they are faring as well or as badly as everyone else". But therein lies the danger. The economy has sagged badly in the past year with no sign yet it has bottomed out. "If we get the economy going again," says Vikram Sood, "all these issues will wither away. If it doesn't happen, they will multiply, disproportionately."